We believe each newsletter has a story to tell—literally. Let our team give your publication a life of its own with eye-catching design and professional layout. Our award-winning graphics team can spruce up your existing newsletter design with vivid, full-color imagery or create a newsletter from scratch. 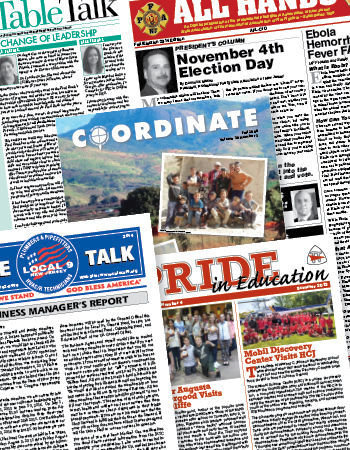 A few of the types of newsletters that organizations have trusted us to create include: Business Newsletters, Corporate Newsletters, Digital Newsletters, Non-Profit Newsletters, School Newsletters, Union Newsletters and more! Stay in touch with your audience by sending them a postcard in between newsletters. "...thank you for all the work you have done for our Local. You were always there no matter how many times I changed things up. I appreciate all the hard work." "As always, thank you for an EXCELLENT job. It is ALWAYS a pleasure working with you."